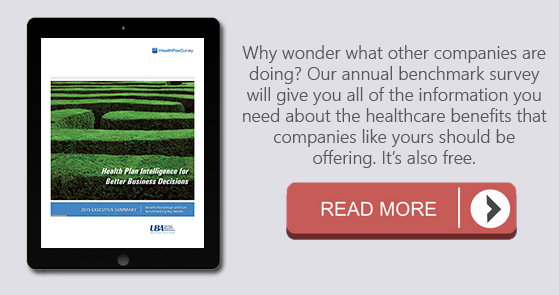 2015 UBA Health Plan Survey Executive Summary Now Available! Rates are up modestly, but increases are on the horizon. Factors driving rates higher: Small groups forced into community-rated, high-cost plans that are compliant with the Patient Protection and Affordable Care Act (ACA), and lack of negotiating power among small groups. Factors temporarily holding costs steady: Large group negotiating power, grandmothered employers avoided ACA-compliant plans, UBA Partners leveraged their bargaining power. Rate outlook: Overall, rates are expected to rise and employers will continue to reduce benefits and pass costs to employees. Retail, construction and hospitality employees cost the least to cover; finance and government employees (the historical cost leader) and finance employees (the new leader) cost the most. The upcoming Cadillac tax isn’t restricted to “rich” plans alone. In fact, a surprising number of employers are expected to exceed the Cadillac tax threshold. Employees feel the squeeze financially, but have more shopping options. Employee contributions are up modestly; copays held steady. Deductibles and out-of-pocket maximums are rising rapidly. Health savings account (HSA) plan contributions decreased. Employers are offering more plan options at different price points. PPOs, CDHPs and 4-tier prescription plans have the biggest impact. Preferred provider organization (PPO) plans cost more than average but still dominate the market. Prescription plans are rapidly moving to four tiers with blended copay/coinsurance models, making it the fastest growing pharmaceutical cost-containment strategy. Overall, wellness program adoption is up, but program design is changing. Health risk assessments are down while biometric screenings and physical exams are on the rise. Increase in self-funding for all group sizes. Rate stabilization in groups with 51 to 100 employees as an ACA amendment helps them avoid community rating. Mail order pharmaceutical programs more for convenience than cost savings. Metal levels are now tracked in the UBA Health Plan Survey. Most plans are gold metal level or higher. To benchmark your plan against others in your region, industry or size bracket, contact a UBA Partner near you to run a custom benchmarking report..